Haplogroup N1c1 is often connected to the Uralic languages, although it lacks in most of the Samoyed peoples. This haplogroup may have surprised many who are testing their paternal lineage, because it is actually found very widely in Europe, although in low frequencies: in Scandinavia, Poland, Germany, British Isles and even Spain. 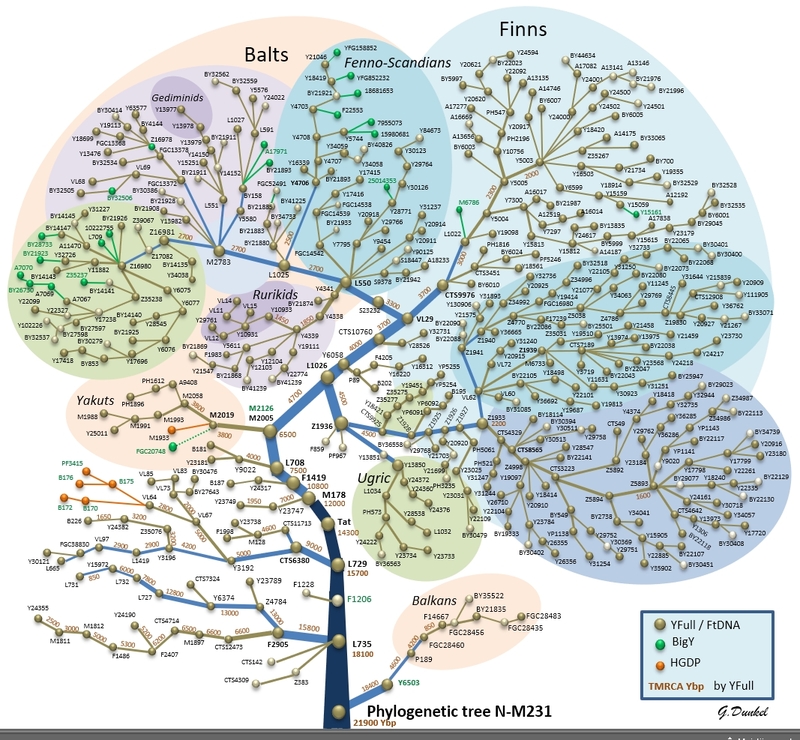 So far there is no official phylogeny ("family tree") of N1c1, but many amateurs have been independently working on the topic - myself included. In Spain there seems to be an early separated cluster. In Germany and Central Europe the N1c1 is derived from the Balto-Polish group. In British Isles N1c1 is mostly of the Scandinavian type, probably due to the Viking activity. Scandinavian and Balto-Polish groups seem to derive from the North European N1c1, while in Finland and Russia there are groups and subgroups deriving mostly from the East European N1c1. So far only "ready" is VL29 (--> L1022, L550, L1025), but Z1936 (--> Savonian, Karelian) is under construction. Looks very good, I definitely look forward to seeing Z1936! My FTDNA kit 560309. Updated to big-Y. No matches of this branch in Russia. As I understand it's a small branch in base of CTS8565. Could somebody give an advise? There are only 6 samples, three Y30513, two BY18114 and one waiting for its sub haplogroup. You have to find out if A7205321C, BY30394, Y30513, BY18114 were the same mutations with different names. I remember Georg Dunkel released his Z4998- tree about a month ago but i cannot find the link anymore. It was at Ftdna North Eurasia group. They are now changing hg19 -> hg38. It takes lot of work. So the Big Y results are in change. For example I had 70 Big Y matches and they have disappeared. Then my haplogroup changed. And I am still waiting matches back. I think that the changing process has taken more resources and time than they expected. I checked your new terminal SNP BY30394 hg38.pos.7205321 and hg19.pos.7073362 (A>C) and YFull’s browser shows this SNP very stable and there is one sample with this mutation YF09703 (Mr.Peiponen).